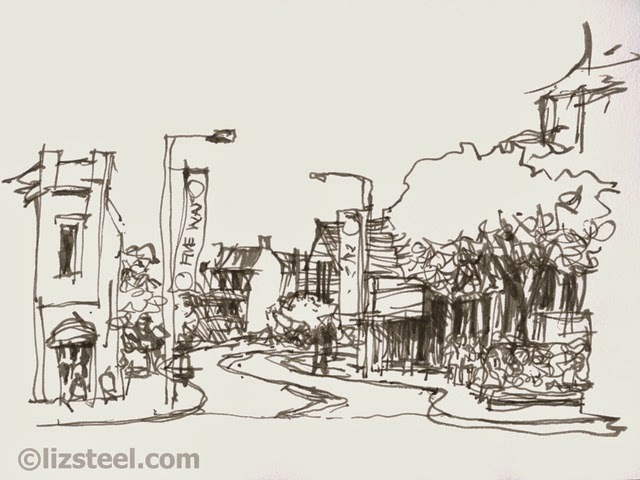 Something quite surprising has happened to me in the last few weeks… I have stopped using my watercolour paints and instead have been totally addicted to sketching just using pen! 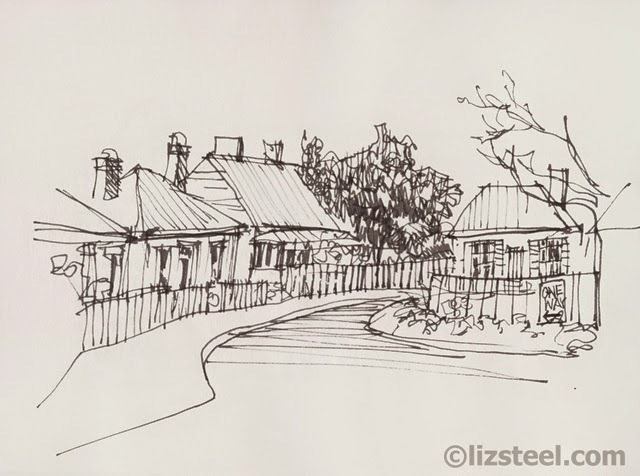 It all started with this sketch that I did in the final hour of a recent trip to Tasmania, where I was making a more conscious effort to sketch street scenes. I was on my way back to the car to drive straight to the airport, it was about to rain, and I didn't want to get out all my paints and do one of my usual quick ink and wash sketches. So instead I just pulled out my Sailor Pen with a bent calligraphy nib and drew the view of Arthurs Circus standing up. It was so quick and easy, and I found that without the distraction of thinking about colour, I was able to focus more on the space and the tone. It was also nice to have a standing perspective. When you sit on the ground or on a stool, your view is below the natural eyeline of walking through the streets - how we actually experience the city. Once I got to my car I did another one before driving off - I have this terrible habit for trying to squeeze 'one more sketch in' when I should be just moving on! This time I was thinking about how to explain tone, colour and texture with my lines…. and after this sketch, I knew that I was hooked. 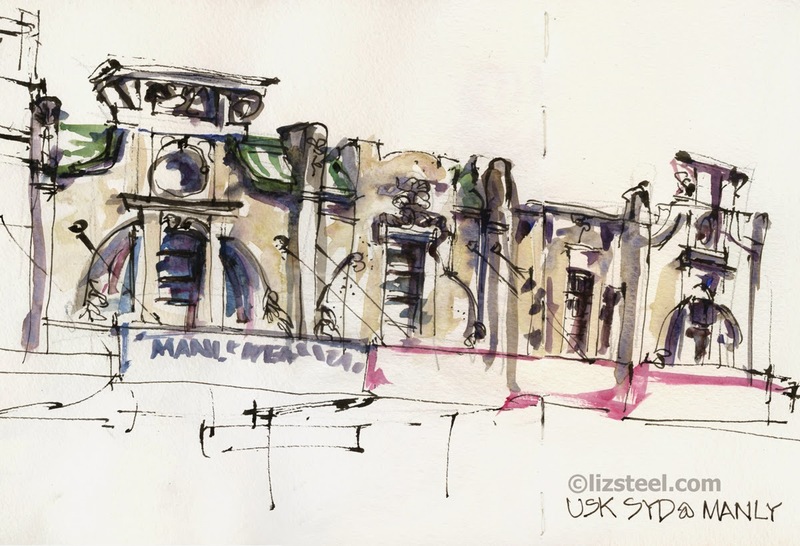 A few weeks ago we had our monthly USK Sydney meeting at the Five Ways intersection in Paddington. 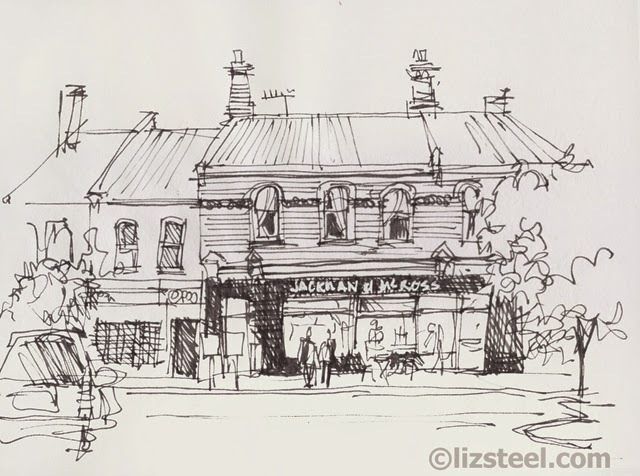 We had set a challenge of 'five ways at Five ways' and with all my organising responsibilities, I knew that it would be hard to get five ink and wash sketches done. A lot of you know that I normally use a very quick gestural form of setup, but on this occasion I went straight for ink. I really wanted to focus on accuracy and recording the sense of place as I stood on each of the five corners, and once again because I was only using one tool, I found it easier than I expected. When I started sketching regularly 8 years ago, the fact that I wanted to paint helped me push through the drawing in order to get to the colour - the next stage pushed me ahead. In a way, this is the opposite - because I am not even thinking about painting, I am liberated to try more complex scenes - I am drawing rapidly but with a degree of accuracy that I am pleased with (of course it can always be better). You can see the full set from this day in Paddington here. I also have written a blog post about measuring and accuracy on my blog here. Anyway, I am buzzing! Instead of my usual sketches where I explore the architectural design of a single building, I am wanting to draw the whole scene, and do this in my usual spontaneous and quick way. Instead of colour, I am loving the decision making of how to treat colour vs tone vs texture with line. 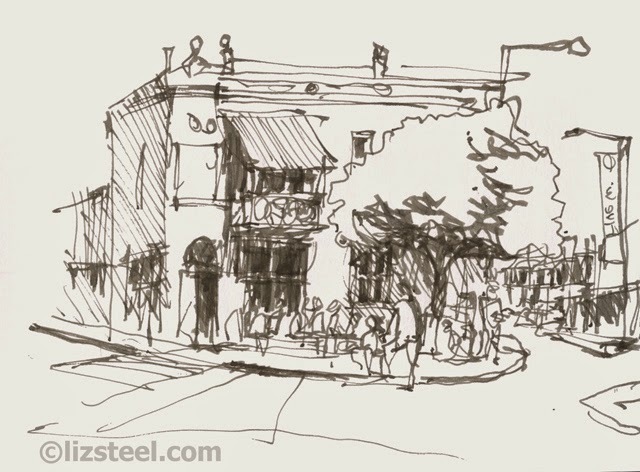 Here is a watercolour sketch of a single building on The Corso Manly that I did in October, contrasting with my sketch from a few weeks ago - wanting to draw The Corso as a whole. I am still doing my cups of tea in paint (hold on… there has been more coffee lately…what is going on? ), but the main excitement is my panoramic scenes. I never know what direction my creative journey will head next, but I sure enjoy the ride where ever it takes me. I am sure my colour will come back soon, but I am enjoying this period to focus on accuracy in my drawings, my lines and marks. And especially that it is enabling me to tackle more complex scenes that tell a richer story about where I am.